Have you ever wondered what it would be like to live out on the road? 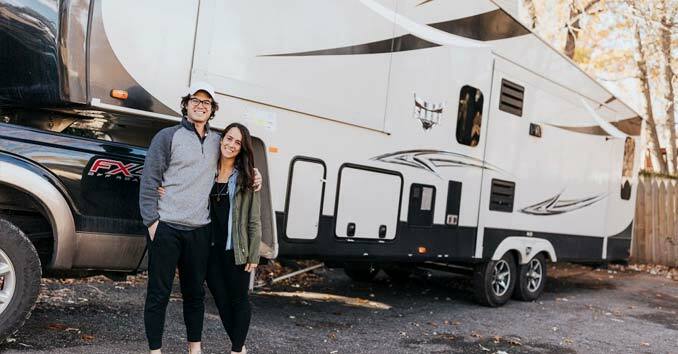 Check out our latest RV living story about how two newlyweds that decided to travel the country and live and work full-time in an RV. 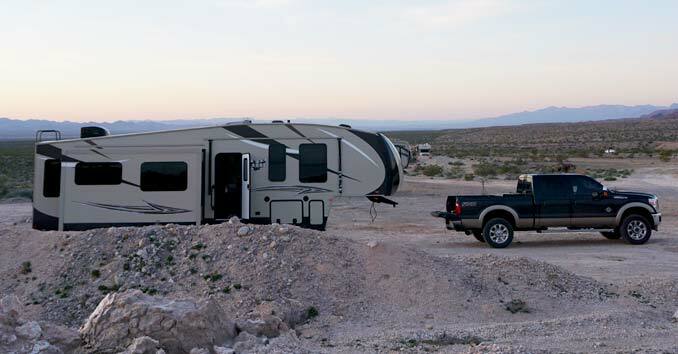 Can you tell us a little about yourself and RV living? We are newlyweds, full-time RVers and digital marketers. We love to travel and when we were deciding on where we wanted to live when we got married, we just couldn’t decide on one place that we wanted to settle down. 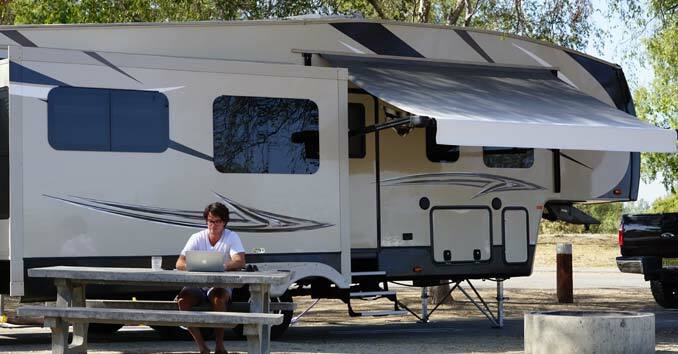 We know we’re fortunate to have a business that we can take anywhere, and Pete came up with the idea to give RV life a try. We thought we’d be on the road for about a year – but now we can’t see ourselves stopping anytime soon! We love living a lifestyle that is outdoorsy, adventurous, and flexible, but still allows us to feel “at home” all of the time. Can you tell us about your Trailer and if you’ve had to customize it? The current RV that we’re in is a 35-foot fifth wheel. We actually worked out a partnership with the company who sells it to create lifestyle content for them in exchange for living in the RV, so we weren’t able to make any customizations. Now that we’ve been on the road for almost a year, we are looking at buying our next RV and absolutely plan to do a renovation! We’d really love to have a bunkhouse model that would allow us to have our own office in the RV. Can you tell me about your RV and what you do you do for power, water, heat, and communications? We typically stay at RV parks, and we try to find state or county parks if possible. We’ve found they have the most affordable rates and usually the most space and quiet as well! Because we work full-time on the road, we need to have electricity and cell service or wifi, so we haven’t boondocked a lot. We don’t have a generator right now, so we mainly stay at RV parks and campgrounds. If we don’t have full hookups at a campground, then we’ll just fill all of our fresh water tank and stay about a week before we need to dump (we cook almost all of our meals and have quite a few dishes every day!). For communications, I have Verizon and my husband has Google Fi. We have a Verizon Jetpack mifi for internet too. When you’re not driving, where do you park your 5th wheel? We park more often than we drive. We prefer to stay a week at least in each place, so that we can balance work and adventure. This past winter, we actually stayed 2 1/2 months in Breckenridge, CO and then a month in Park City, UT and we LOVED staying planted a little longer! This past month, we traveled around British Columbia and Alberta and drove all the way back to Philadelphia in a few days, so it was a much busier time of travel! We definitely prefer longer stays though. Does people ever bother you out on the road or when you’ve set up a basecamp? We’ve never been bothered. The biggest annoyance is usually just other people watching you backup and maneuver into a spot! We did show up to one boondocking spot in Bend, Oregon that we didn’t feel comfortable at, so we didn’t stay there. We have friends that recommend having a “dog on board” sign or even leaving dog bowls out if you’re in a more remote spot to signal that you have a dog on board if you want to be extra safe! Do you have an emergency backup plan for bad weather or anything else that may go wrong? If we’re nervous about the weather, we won’t drive. Wind and rain can be really scary in an RV, especially when it’s 35 feet long and over 10,000 pounds. We’ll stop if we have any concerns, and my husband always checks the weather before we drive. We use the Storm radar app and we’ve found it to be really reliable and helpful! If you’re thinking about RV life, there are great ways to try it before you buy! 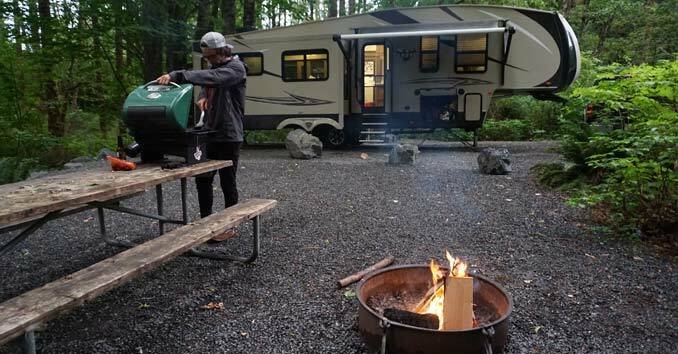 There are rental companies like Outdoorsy that will allow you to get a taste of life on the road before you buy your own RV. Another piece of advice would be that you don’t need as much space or things as you’d think! I never thought I’d be able to scale down to 35-feet, and now I know I could live with a lot less – it’s really freeing! And finally, the best advice we were given is that things ARE going to go wrong. How you handle it and deal with it makes all of the difference. One of the things we’ve been most surprised with on the road has been the community we’ve found. Camping World actually just did a whole video story on community and our recent trip to Banff with friends who we met through RV life. It does take more effort to stay connected to family and friends, mainly because a lot of people tend to think we’re on vacation mode and don’t reach out like they used to. We don’t go out very often in general, but we’ve been able to meet people in almost every place we’ve traveled! Whether its on a hike or at the dog park or at church, we’re always connecting with new friends. The small space really isn’t the hardest challenge of RV life. Maybe not having a washer and dryer and needing to do laundry can be a little difficult, but we really don’t feel like we have less than we need. One of the challenges is definitely organization – but if you can master that, living tiny can be way easier than you imagined! We’ve had to replace a bald tire ourselves, our pipes froze 5 times while winter RVing, we built our own “skirt” for the snow and cold, we have had multiple things break in the RV – and honestly you just learn as you go. YouTube is a great friend! One thing that we value more now than we did when we started is finding an RV that is made well. As full-timers, we realize these RVs are not meant to be driven and lived in non-stop, and so finding one that is well-made and can withstand a little more than normal is a big priority for us when shopping! We have a digital marketing company. We help creative entrepreneurs and wedding professionals grow their businesses with smart marketing strategies. We have clients all over the country and do almost all of our work remotely (unless we have the ability to meetup with a client in person!). We had our business for two years before we went full-time, so we were able to plan the transition and set expectations with our clients. Our expenses are very similar to what they’d be if we were’t on the road – so like anything, budgeting is key. We have a lot of friends that work their normal jobs remotely, so that can be a great option for becoming an RVer! If you want to work for yourself, blogging is a great opportunity as well, but I’d recommend having something already in place that you know can support your family for at least 6 months before taking the plunge. You can totally do it! It’s not as scary or crazy as it looks. I’d also say that if there’s someone you admire who is living a lifestyle you’re interested in, reach out to them! 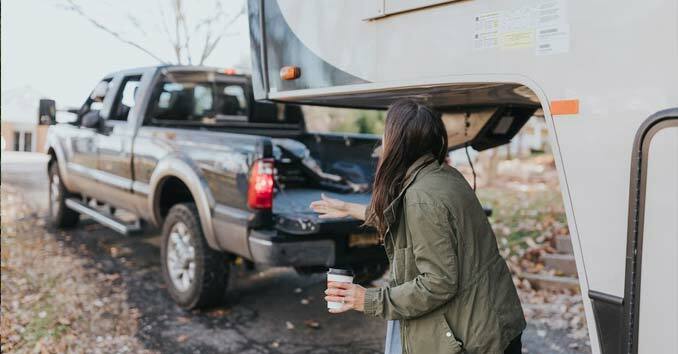 We connected with so many full-time RVers on Instagram before we ever got on the road and not only were they so helpful, but it was great to have a community of friends who understand our same mindset too. One thing you could do to prepare is to start simplifying your life. We’ve heard from friends that downsizing and letting go of material things can be one of the hardest parts of the transition. We didn’t have a lot of stuff before we went full-time, but if you do – start now. Slowly simplify your life. I’d also listen to the RV Entrepreneur Podcast and join the Facebook group! It’s an amazing way to connect with other like-minded people and learn from others who are already out on the road full-time!